Evaluated at US$2,296.0 mn in 2017, the opportunities in the global sales performance management (SPM) market are estimated to translate into a revenue of US$8,138.1 mn by 2025, with the demand expanding at a formidable CAGR of 17.1% during the forecast period of 2017 to 2025. SPM tools are highly useful for organizations to train and monitor their workforce pertaining to product sales and customer services. Sales performance management also helps in forecasting and achieving quota usually by focusing on processes and utilizes innovative tools to help individual sales and channel personnel. The SPM software are also used to track information about territories, sales quotas, incentive compensation, job forecasting and evaluation. Sales performance management services are broadly used in banking and financial service institutions, healthcare, telecom & IT, and retail among others. 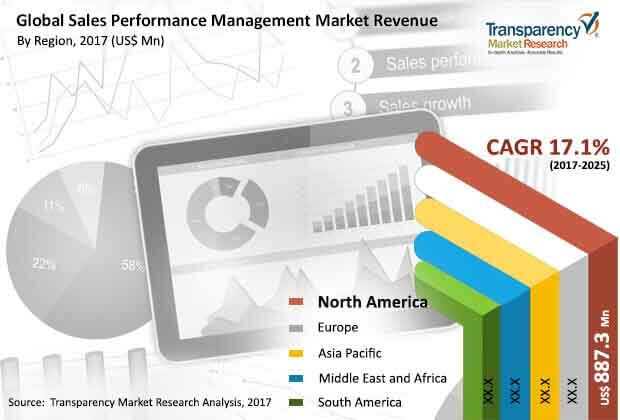 The global sales performance management market is exhibiting high growth prospects on the back of various factors such as growing focus on sales performance management procedures and massive investments in predictive analytics. Small and medium enterprises are automating their sales performance management with the help of these tools and software, making their employees more productive and efficient. Apart from this, vendors desire for capability enhancement and streamlining of business processes are some of the other factors that are expected to boost the sales performance management market in forthcoming years. On the other hand, data security concerns, lack of awareness regarding the benefits of SPM, and cost of these tools are obstructing the market from attaining its true potential. On the basis of component, the sales performance management market is segmented into software and services. The software segment is further categorized into on-premise and cloud-based. Among these, cloud-based sales performance management software deployment is the major segment, which provided for 59% of the total demand in 2017. This segment is driven by increasing adoption of SPM software by organizations to enhance management of end-to-end business processes across each application. The services segment is further sub-segmented into managed services and professional services. Based on solution type, the sales performance management market is bifurcated into incentive compensation management, sales planning, sales forecasting, sales coaching, quota and territory management, talent management, others including sales analytics, sales reporting, and gamification. Among these, sales forecasting and sales planning solutions are the key segments which are expected to propel the growth of the sales performance management market around the globe. On the basis of end-use industry, the global market is bifurcated into banking, financial services and insurance (BFSI), retail, healthcare, telecom & IT, and others including manufacturing, transportation, and logistics. As of 2017, North America was the most profitable region for the vendors operating in the global sales performance management market, providing for a demand worth of US$887.3 mn, followed by Europe. High adoption rate of SPM among end users such as BFSI and telecom and IT is the primary driver of strong demand for SPM from these two regions. However, these two regions are showcasing slightly lower growth rate than the region of Asia Pacific, from where the demand is projected to expand at an above-average CAGR of 18.5% during the forecast period of 2017 to 2025. The emerging economies of India and China are fueling the APAC SPM market on the back of unceasing growth across diverse sectors owing to its capability to improve quality of organizational structure. The Middle East and Africa (MEA) sales performance management market is also projected for a healthy growth during the forecast period. This report provides an analysis of the global sales performance management market for the period of 2015 to 2025, wherein the period from 2017 to 2025 comprises the forecast period and 2016 is the base year. Data for 2015 is provided as historical information. The report covers all the major trends and technologies playing a major role in the growth of the sales performance management market over the forecast period. It also highlights various drivers, restraints and opportunities expected to influence the market’s growth during the said period. The study provides a holistic perspective on the market’s growth in terms of revenue in US$ Mn, across different geographical regions namely North America, Europe, Asia Pacific, Middle East & Africa and South America. The market overview section of the report showcases the market dynamics and trends such as the drivers, restraints and opportunities that influence the current nature and future status of this market. The report also provides ecosystem analysis and key market indicators for the sales performance management market. The sales performance management market data estimates are the result of our in-depth secondary research, primary interviews and in-house expert panel reviews. These market estimates have been analyzed by taking into account the impact of different political, social, economic, technological and legal factors along with the current market dynamics affecting the market growth. Sales performance management software is used to provide a mechanism for guiding and monitoring sales representatives (reps) in order to better mentor the best practices of the sales organization, manage performance of individuals, motivate behaviors and improve sales reps ability to sell, by associating performance and revenue analytics together. At present, companies are unceasingly accepting the tools which helps in building and enhancing the sales and productivity of an organizations. This is impelling the demand for sales performance management solution across various end-use industry such as BFSI, healthcare and telecom & IT across the world. Sales performance management market is bifurcated by component, solution and end-use Industry. By component, the global sales performance management market is segmented into software and services. Software segment is further categorized into on-premise and cloud-based. Among these, cloud-based sales performance management software deployment is the major segments which are expected to fuel the growth of this market over the forecast period. Furthermore, services segment is further categorized into managed services and professional services. Based on solution type, the sales performance management market is segmented into incentive compensation management, sales planning, sales forecasting, sales coaching, quota & territory management, talent management, others. Further, the others segment includes gamification, sales analytics, sales reporting, etc. Among these solution, sales forecasting and sales planning solutions are the key segment which are expected to enhance the growth of sales performance management market around the globe. On the basis of end-use industry, the global market is bifurcated into banking, financial services and insurance (BFSI), retail, healthcare, telecom & IT and others. Further, the other segment includes manufacturing, transportation and logistics, etc. The report also includes competitive profiling of the key players associated with the sales performance management market around the globe. The important business strategies adopted by them, their market positioning, financials, SWOT analysis and recent developments have also been identified in the research report. The competitive landscape section of the report also gives an overview about the major contributing regions/countries by these key players in order to strengthen their market position in the future. Some of the major players in global sales performance management market are Accent Technologies, Inc., Altify, Xactly Corporation, Anaplan, Inc., Callidus Software Inc., Entomo, Inc., Hybris AG, IBM Corporation, Microsoft Corporation, Oracle Corporation, Silvon Software Inc., and The Aberdeen Group. Details such as financials, business strategies, SWOT analysis, recent developments, and other such strategic information pertaining to these players has been duly provided as part of company profiling.